Timelines are a great teaching tool. It helps take some of the confusion out of history. Using the template from Kidspiration, students will divide their timeline into three equal parts, past, present, and future. The picture that is created helps students see how transportation has evolved, changed and even overlapped through time. You are going to Mali! Well, not really, but you will need to pack a suitcase as if you were going there. What items you select will be based on the information you gather about this region. Students will be creating a travel itinerary and list your items along with why you selected that item. Wouldn’t it be neat if you could have the ability to travel back in time? Consider it done; with a catch….your destination will be my choice, not yours. You must go back in time when the Native Americans weren’t taken over by the Europeans. You will be assuming the role of a newspaper reporter and record the life styles of the Native Americans. Your end product will be the creation of a Native American Newsletter. This unit is designed to give 4th grade students a pictorial view of Virginia's past and present. Many of our Virginia students haven't experienced a trek across Virginia's five regions. To bring the state a little closer, students will create postcards from Virginia's five regions. The pictures will be a representation of what the regions looked like prior to settlement and present day. 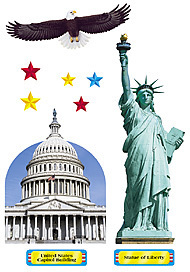 This lesson is designed to teach 1st grade students the meaning of symbols and what they stand for. Students will create a slide show by creating their own class or school flag, then continue the lesson by drawing some symbols they have learned. Slides can be put together in Movie Maker to create a class movie. Not my project, but I love it! It's an interactive game that 4th graders will love playing! Colonial Spy Games - A Quest for the Truth! In the computer class, you will create an epitaph of a famous American that you have (or will) cover this year. A list has been provided for 3rd grade students. In the library, you will use the plan sheet to get you started. With the help of a rubber duck, 5th graders will embark on a quacktastic adventure!This project begins with the classic tale of the famous Mallard ducks of Boston, Robert McCloskey's award winning book, Make Way for Ducklings and ends with a multimedia project that includes ducks, pictures and movies, oh my! In this activity, students will learn about simple animal adaptations including how they look, what they eat, where they live and some basic behaviors. They will realize that everything, animals and plants have adaptations. This is a fun book to integrate Science with Language Arts. It follows the tale of a worm's life over the course of a few months.. Students learn why the situations and illustrations in the story are humorous as each situation relates to the food chain and life processes. The story is told through the worm's diary and is perfect fro introducing the concept of blogging or journal keeping. Frogs, like many living things, go through a lot of changes to get from an egg to a full grown frog. But unlike most animals, frogs go through a change called, metamorphosis.In this activity, you will learn what metamorphosis is and illustrate your own frog cycle using PowerPoint, Pixie4 or Kidspiration. The student will research an animal and understand how it is adapted to live within its own ecosystem. In cooperation with the Librarian, Art Specialist and Technologist, students will research, sort, produce and communicate their project. What is the purpose of Web Site? Why did they put the information on the Internet? What is the web site trying to do? Why was it created? This lesson helps student's to understand why websites are created and how to validate a URL. Sell things like services and products? Through the use of Discovery Education, students will lean about that all animals have adaptations that allow them to survive in their unique habitat. Since most students have some knowledge of wild animals, they will begin to think of places on Earth (continents) through animal habitats and environments. his activity is designed to help first grade students understand the physical properties of matter. The ideas in this lesson will help lay the foundation for exploration of concepts such as density and forces in the later elementary grades. This activity can be done in cooperation with the Librarian. 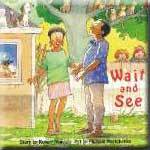 A good introduction is to read the story: "What's the Matter in Mr. Whisker's Room?" Warm Up This Season With a Good Recipe! Books reports, who hasn't done one? To make the report more than just a book report, students will have fun illustrating and mapping out their story using a presentation program either on a mobile device or computer. They can turn a blah report into a perfect presentation using links, animations, sound effects and much more! What a fun activity to begin the year with your 2nd graders. 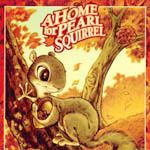 They will enjoy listening to the tale of Pearl Squirrel as she prepares for winter. She is anxious to show it off to her woodland friends only to be told by them that their home is much better than hers. Get ready for an engaging discussion followed by and hands on activity using a production application, like Pixie4 or Kidspiration. This can also be done on a mobile device. In this lesson, the students will use pictures and text to create a booklet that represents a little ditty about themselves. Objective of this lesson is to reinforce main idea. The students will use Kidspiration or Pixie 4 to create a Wish List accompanied by a pictorial. In fourth grade, reading and writing skills support an increased emphasis on content-area learning and utilization of the resources of the media center, especially to locate and read primary sources of information. To help support these objective, students will use technology to search, sort, produce and communicate a Poetry PowerPoint presentation. Students will use the resources from the internet as well as the media center. Students will read the Folk Tale, "Creation of the Night" and make a picture booklet using PowerPoint about the folk tale using a set of guidelines.